For seniors who wish to remain in the comfort of home throughout aging – and, who wouldn’t? 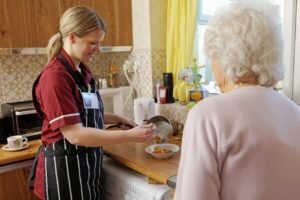 – in-home care services provide a lifeline, offering assistance with daily activities that can become difficult in later years and supplying a means of safety, security and enhanced independence. But what happens when an older adult is struggling with a disease, such as chronic kidney disease? Providing education on management of the disease. Caregivers work hand in hand with the senior’s doctor to make sure he or she is well educated on the disease and how to best manage it. Supplying medication reminders. Sticking to a prescribed medication plan is key to optimal health. An in-home caregiver can provide timely reminders so that each medicine is always taken exactly as prescribed. Offering transportation and accompaniment to doctors’ appointments, medical procedures, etc. Assisting seniors in avoiding hospital readmissions by recognizing and reporting any early signs of complications, and obtaining immediate treatment. Preparing nutritious, balanced and diet-specific meals. Caregivers work with both physicians and dietitians to make sure meals adhere to the specific requirements for each senior’s condition. To learn more about how our trusted Tri-Valley area senior care services can help your senior loved one not only survive but thrive through the help of in-home care, call us at (866) 940-4343. We can provide the necessary encouragement and support for your loved one to remain motivated to follow a healthy dietary plan, exercise, and adhere to doctors’ orders for medications, appointments, treatments, surgical procedures, etc. as needed. Contact us with any questions about our in-home care services or to arrange for a free in-home consultation to take the first step in improving quality of life for your senior loved one!